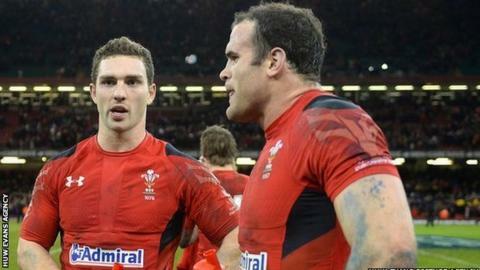 Wales wing George North has been switched to centre for Saturday's World Cup Pool A decider against Australia. Gareth Anscombe comes in at full-back and fit-again Liam Williams returns on the left wing, with North taking over from Tyler Morgan at outside centre. There are four changes up front, where Justin Tipuric starts at open-side flanker and Luke Charteris at lock. Props Paul James and Samson Lee come in as Gethin Jenkins, Dan Lydiate and Bradley Davies drop out of the 23. Lee has taken the tight-head spot from Tomas Francis, who moves to the bench. Lydiate (eye socket) and Davies (nose) were injury doubts before the match-day squad was named. Gatland said had Wales been in the World Cup final, Lydiate would have been involved, but felt the Osprey's "soreness" warranted a rest. Veteran prop Jenkins' injury history combined with James' return to fitness from a calf problem prompted that change. Gatland said Jenkins has often "broken down" after playing three or four consecutive games and he wanted the player "fit and fresh" for the quarter-finals. "And Paul James needed a game," added Gatland. Lock Jake Ball comes on to the bench, with Ross Moriarty the preferred replacement back-row option. North played in the centres against Australia last November, the most recent of the 10 successive games Wales have lost against the Wallabies. He takes over from rookie Morgan, who helped Wales beat Fiji 23-13 following injuries to Jonathan Davies, Scott Williams and Cory Allen. New Zealand-born Anscombe will make his World Cup debut after overcoming the ankle injury that ruled him out of Wales' initial squad. The Cardiff Blues utility back was called up along with the versatile James Hook after Scott Williams (knee) and wing Hallam Amos (shoulder) were ruled out of the tournament with injuries sustained in Wales' win over England at Twickenham. Gloucester's Hook came off the bench as Wales beat Fiji and again does back-up duty, with Matthew Morgan omitted from the match-day squad. Ospreys lock Jones will win his 99th Wales cap while captain Sam Warburton switches to blind-side flanker to accommodate Tipuric. "Saturday is another huge encounter and both sides will be coming in with momentum and looking to top Pool A," said Gatland. "We have been impressed with Australia so far in this competition and we know a step up is required at Twickenham this weekend. "It is still all to play for in terms of the knockout phases." Injuries prompted Australia to delay naming their team until 13:00 BST on Thursday. Backs: Gareth Anscombe (Cardiff Blues); Alex Cuthbert (Cardiff Blues), George North (Northampton Saints), Jamie Roberts (Harlequins), Liam Williams (Scarlets); Dan Biggar (Ospreys), Gareth Davies (Scarlets). Forwards: Paul James (Ospreys), Scott Baldwin (Ospreys), Samson Lee (Scarlets), Luke Charteris (Racing 92), Alun Wyn Jones (Ospreys), Sam Warburton (Cardiff Blues, capt), Justin Tipuric (Ospreys), Taulupe Faletau (Newport Gwent Dragons). Replacements: Ken Owens (Scarlets), Aaron Jarvis (Ospreys), Tomas Francis (Exeter Chiefs), Jake Ball (Scarlets), Ross Moriarty (Gloucester Rugby), Lloyd Williams (Cardiff Blues), Rhys Priestland (Bath Rugby), James Hook (Gloucester Rugby). Wales have not beaten Australia since 2008, losing 10 in a row against the Wallabies since then. The last nine between the two have all been won by margins of fewer than 10 points, with seven of those being settled by fewer than seven. David Pocock has won eight turnovers, four times as many as any other Wallaby at the World Cup.